Today, the Cleveland Commemorative Silver Half Dollar Coin remembers the arrival of the first baby born in Ohio of European descent on April 16, 1781. The following letter addressed to the editor of the “American Pioneer,” was written by the daughter of the well-known missionary to the Indians, the Rev. John Heckewelder. Miss Heckewelder was the first white child born in Ohio. Her narrative of the toils and sufferings among the Indians is highly interesting. Bethlehem, Pa., February 24th, 1843. Dear Sir — Yours of the 31st ult., to Mr. Kummen, post-master at this place, has been handed to me. I have not been in the habit of making much use of my pen for a number of years; I will, however, at your request, endeavor to give you a short account of the first four years of my life, which were all I spent amongst the Indians, having since lived in Bethlehem nearly all the time. My acquaintance or knowledge of them and their history, is chiefly from books, and what I heard from my father and other missionaries. I was born April 16th, 1781, in Salem, one of the Moravian Indian towns, on the Muskingum river, state of Ohio. Soon after my birth, times becoming very troublesome, the settlements were often in danger from war parties, and from an encampment of warriors near Gnadenhutten; and finally, in the beginning of September of the same year, we were all made prisoners. First, four of the missionaries were seized by a party of Huron warriors, and declared prisoners of war; they were then led into the camp of the Delawares, where the death-song was sung over them. Soon after they had secured them, a number of warriors marched off for Salem and Shoenbrun. About thirty savages arrived at the former place in the dusk of the evening, and broke open the mission house. Here they took my mother and myself prisoners, and having led her into the street and placed guards over her, they plundered the house of everything they could take with them and destroyed what was left. Then going to take my mother along with them, the savages were prevailed upon through the intercession of the Indian females, to let her remain at Salem till the next morning—the night being dark and rainy and almost impossible for her to travel so far — they at last consented on condition that she should be brought into the camp the next morning, which was accordingly done, and she was safely conducted by our Indians to Gnadenhutten. After experiencing the cruel treatment of the savages for some time, they were set at liberty again; but we were obliged to leave their flourishing settlements, and forced to march through a dreary wilderness to Upper Sandusky. We went by land through Goshachguenk to the Walholding, and then partly by water and partly along the banks of the river, to Sandusky creek. All the way I was carried by an Indian woman, carefully wrapped in a blanket, on her back. Our journey was exceedingly tedious and dangerous; some of the canoes sunk, and those that were in them lost all their provisions and everything they had saved. Those who went by land drove the cattle, a pretty large herd. The savages now drove us along, the missionaries with their families usually in the midst, surrounded by their Indian converts. The roads were exceedingly bad, leading through a continuation of swamps. Having arrived at Upper Sandusky, they built small huts of logs and bark to screen them from the cold, having neither beds or blankets, and being reduced to the greatest poverty and want; for the savages had by degrees stolen almost everything, both from the missionaries and Indians, on the journey. We lived here extremely poor, oftentimes very little or nothing to satisfy the cravings of hunger; and the poorest of the Indians were obliged to live upon their dead cattle, which died for want of pasture. After living in this dreary wilderness, in danger, poverty, and distress of all sorts, a written order arrived in March, 1782, sent by the governor to the half king of the Hurons and to an English officer in his company, to bring all the missionaries and their families to Detroit, but with a strict order not to plunder nor abuse them in the least. The missionaries were overwhelmed with grief at the idea of being separated from their Indians; but there being no alternative, they were obliged to submit to this, one of the heaviest of their trials. The poor Indians came weeping to bid them farewell, and accompanied them a considerable way, some as far as Lower Sandusky. Here we were obliged to spend several nights in the open air, and suffered great cold besides other hardships. April 14th, we set out and crossed over a part of the lakes Erie and Huron. We were lodged in the barracks by order of the governor. Some weeks after, we left the barracks with his consent and moved into a house at a small distance from the town. The Indian converts, gathering around their teachers, they resolved with the consent of their governor, to begin the building of a new settlement upon a spot about thirty miles from Detroit, on the river Huron, which they called New Gnadenhutten, and which increased considerably from time to time. Here I lived till the year 1785, when I set out with an aged missionary couple to be educated in the school at Bethlehem. We commenced our journey about the middle May, and arrived at the latter place July 9th, after a very tedious and perilous journey — proceeding down the river Huron into Lake St. Clair, thence to Detroit, and crossing Lake Erie to Niagara and Oswego, thence down Oswego river to Lake Oneida, thence down the “Waldbah to Fort Stanwix. We then arrived at a carrying place at the Mohawk river, and proceeded to Schenectady; went by land to Albany, and then by water to New Windsor, and then again by land to Bethlehem. I fear my account has become rather too long and tedious. I am much obliged to you, sir, for the Pioneer, it is a most interesting work, and I wish I could but gain some patronage for you; but money is so scarce, there is at present no prospect. 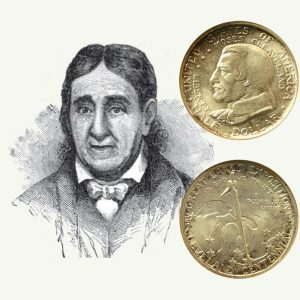 The Cleveland Commemorative Silver Half Dollar Coin shows with an artist’s image of her father, Rev. John Heckewelder.